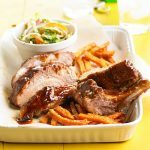 This sweet-tart and slightly spicy sauce is finger licking good on Millgate Farm Heritage Berkshire Pork ribs. It definitely tantalizes the taste buds. Serve the ribs with charcoal grilled vegetables, a tossed green salad and crusty bread. 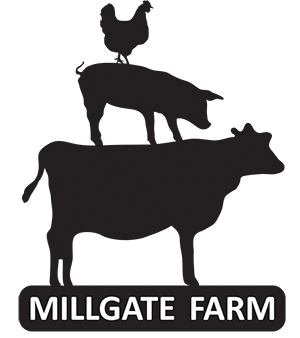 It also makes great pulled pork when using a bone-in pork shoulder roast from Millgate Farm. Rub the shoulder roast with the rub, then put in a 350 degree oven for about 45 minutes until well browned. After browning, put roast in a slow cooker with the sauce and let it finish cooking overnight. 1-2 TBSP Black pepper, coarse grind or substitute 2 TBSP Millgate Farm Steak and Berger Seasoning. Remove the thin membrane from the rib side before applying the rub. Cover and chill for 2-24 hours. Prepare the rub, stir together brown sugar, paprika, garlic powder, pepper, cumin,dry mustard and salt. Reserve 3 tablespoons of the rub, sprinkle remaining rub over both sides of ribs, rub in well. Place ribs in a baking dish, cover and chill 2-24 hours. Prepare the basting sauce to brush on ribs for the last 5 minutes of grilling. To prepare sauce, heat oil in saucepan over medium heat. Sautee onion in hot oil until tender and translucent, about 5 minutes. Stir in tomato sauce, beer, honey, Worcestershire Sauce, vinegar and reserved 3 tablespoons rub. Simmer, uncovered, 20 minutes or until sauce is reduced to 1 1/2 cup. Set sauce aside while grilling pork loin back ribs. To prepare grill, place medium hot coals around a drip pan. (For a gas grill, preheat to medium hot, adjust for indirect cooking and roast ribs in a roasting pan). Place ribs, bone sides down over drip pan. Cover and grill for 1 1/2 to 1 3/4 hours or until ribs are tender. Brush ribs with sauce the last 5 minutes of grilling. To serve, cut ribs into portions. Pass the remaining sauce and extra napkins!